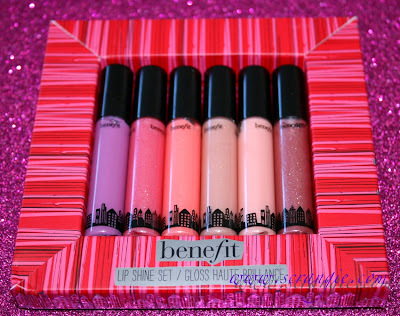 Benefit's Holiday 2011 collection is out in stores now, and among their holiday items is this very surprising lipgloss set. It's called Ticket To Glossytown and it features six mini-size Benefit Ultra Shine glosses in an awesome selection of shades. All of the shades in the set are available full size in the permanent line as well. Feel free to enlarge any image for more detail. 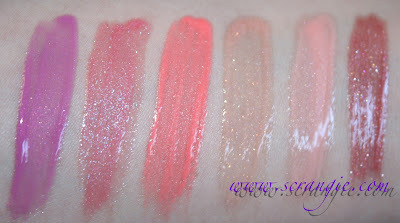 The shades are: Kiss You, Foxy Lady, Spiked Punch, Nudie-tude, Life on the A List and So Frisk Me. The glosses come with a brush wand style applicator. The brush is very short on these. It's a little hard to tell unless you see it in person, but Nudie-tude has actual glitter in it. 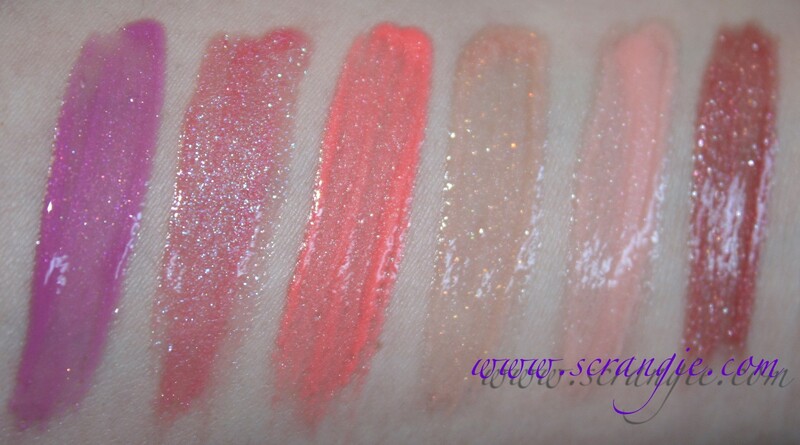 Not just shimmer, but little opalescent microglitter particles. They're subtle, but they're enough to add some sparkle to an otherwise plain color. 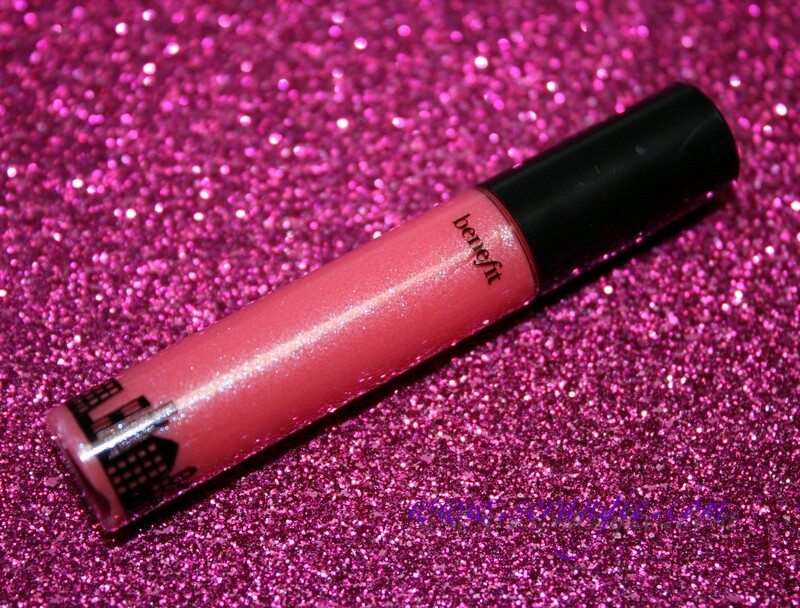 Foxy Lady is a muted coral, but it has BLUE SHIMMER. I think it may even be a turquoise/sky blue duochrome shimmer. 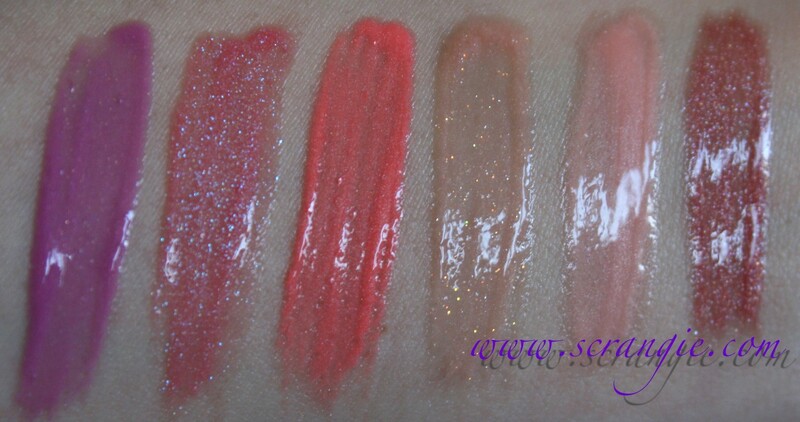 Swatched over bare skin, with flash and without. Kiss You, Foxy Lady, Spiked Punch, Nudie-tude, Life on the A List, So Frisk Me. These have a really nice formula. 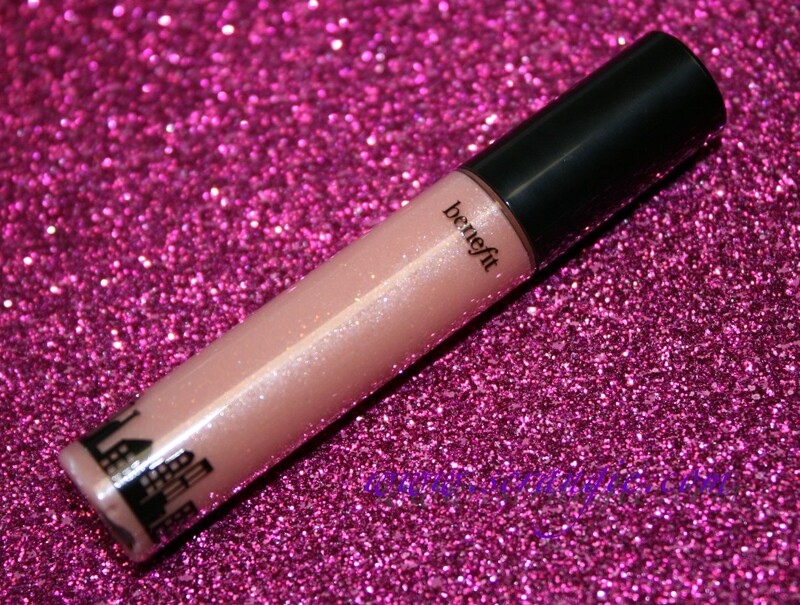 It's thin compared to most glosses and it feels very slick and moisturizing on the lips. It doesn't wear for very long, but the shine and color fade away evenly as it wears. 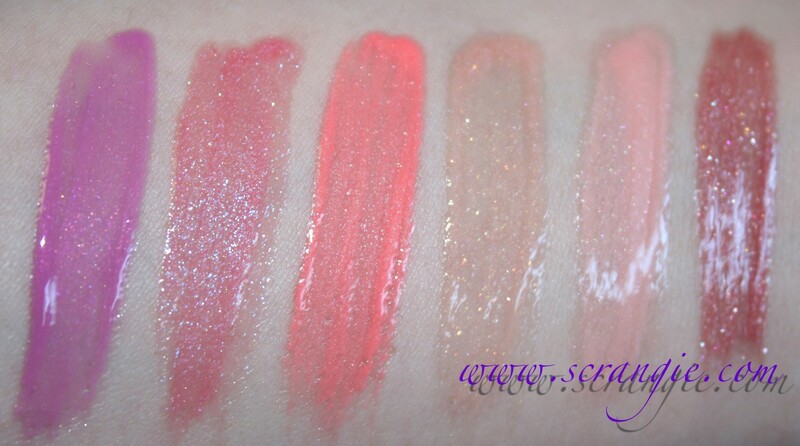 The glosses are also scented with a slight fruity scent, possibly lychee. It's pleasant at first, but after a while it smells a little off to me. The color selection in this set is awesome. It's like the picked all the best colors. 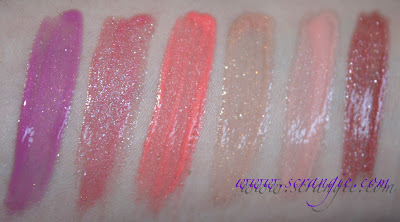 Neon coral, creamy lavender, colors with glitter and multicolor shimmer. Not a bland one in the bunch, even the pale peach is nice. This set includes a purple gloss. A true purple. This is important enough to get its own bullet point. 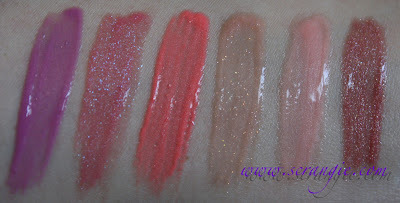 The glosses are non-drying and feel very nice on the lips. No excess packaging or overly long, over molded tubes. Good amount of gloss for a mini- each is 0.1 fl oz / 3.0ml, while a full size Ultra Shine ($18) is .17 fl oz / 5ml. The outer packaging is very attractive and suitable for gifting. The scent smells a little off to me. This could just be me, but I smell something sort of crayon-like underneath the fruit scent. Almost like blue cheese. 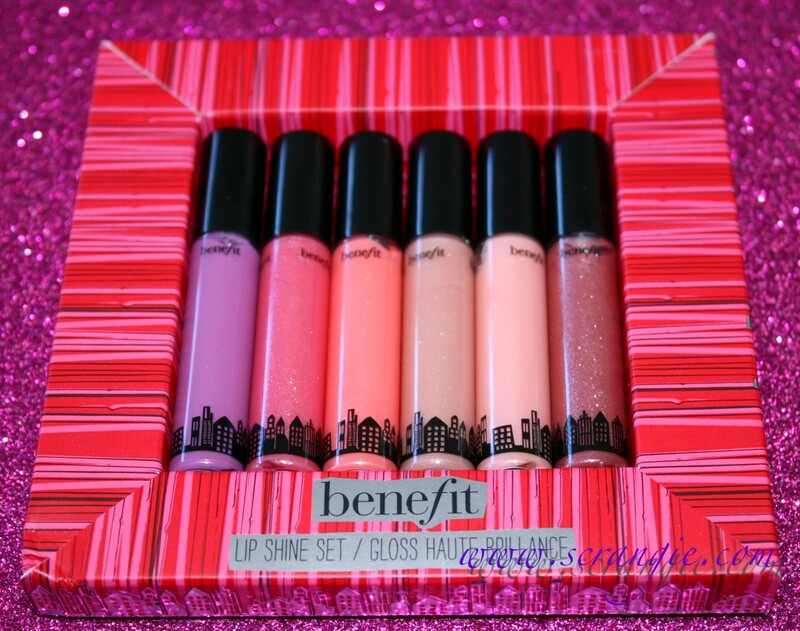 I had this same impression the last time I bought a Benefit gloss, so it's not rancid and it's not just this set. They wear off pretty quickly, the one downside to a non-sticky formula. Overall, I really like this gloss set. This would be one of my top picks for Holiday 2011. The color selection is fun, colorful and sparkly; not at all boring. 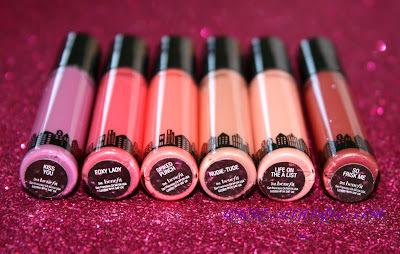 The formula is nice, the size of the product is great (they look tiny, but there's twice as much product in the tubes than in a mini Stila Lip Glaze, which looks three times the size.) and the packaging is cute. Plus, that purple gloss makes me super happy. I do generally prefer mini sets to have exclusive colors, but the upside to these being permanent shades is that once you run out of the mini, you can always buy a full size. 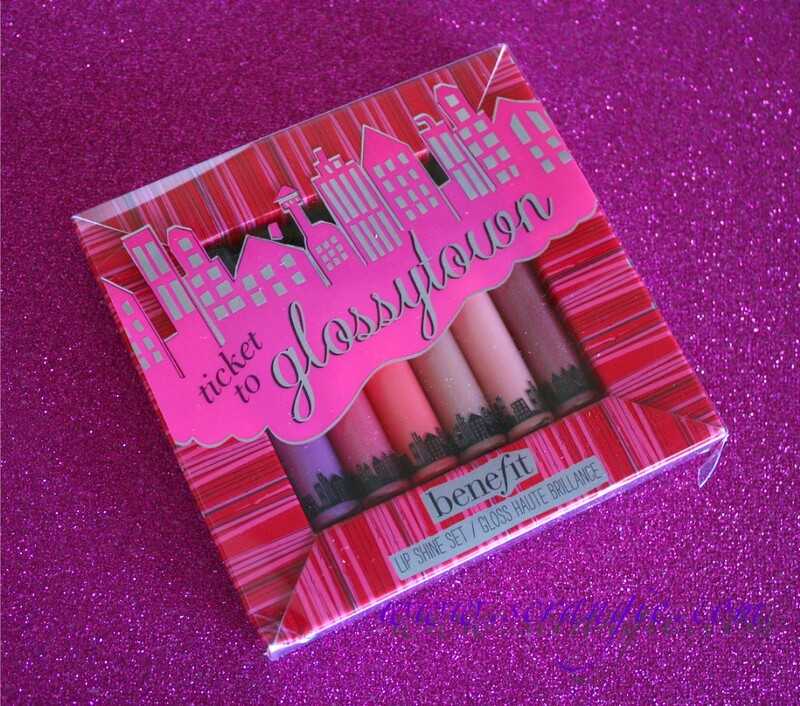 The Benefit Ticket To Glossytown set ($24) is limited edition and available now at Sephora. These look nice! I think I might have to run out tomorrow and get these. As if I need anymore lipgloss! They had a set with exclusive colours a few years ago and people went nutzo insane when they ran out. It was bad enough for Benefit to decide to never do that again. I went to Sephora today to see if I could get these and I didn't see them. I didn't have enough time to hunt around or ask about them but they weren't in the Benefit department. Maybe I'll try again tomorrow and see what they say.